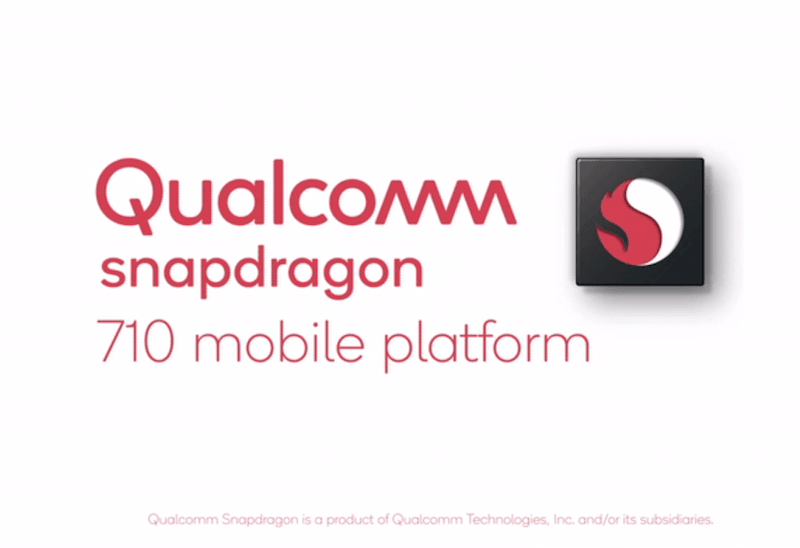 Qualcomm Snapdragon 710 is the latest upper mid-range processor from the chipset company. The Snapdragon 710 Mobile Platform succeeds Snapdragon 660 SoC, which is one of the best chipsets Qualcomm has introduced till date. With the Snapdragon 710, Qualcomm is aiming to premium features to a new tier of smartphones. Firstly, it’s built on the 10nm manufacturing process, which Qualcomm used for the high-end Snapdragon 835 and 845 platforms. It features multi-core AI Engine and neural network processing capabilities. The Snapdragon 710 is the first mobile platform in the new 700-tier portfolio and will be Qualcomm’s answer to upper mid-range smartphones. This new chipset from Qualcomm is promised to deliver superior power efficiency, long-lasting battery and enhanced user experience when compared to Snapdragon 660. Firstly, it uses Adreno 616 GPU, which can yield 40% reduction in power consumption for both gaming and 4K HDR playback as well as 20% reduction in power consumption while streaming videos as compared to Snapdragon 660. Qualcomm has gone with the new Kryo 360 architecture, built on ARM Cortex technology. Furthermore, the Snapdragon 710 supports Qualcomm Quick Charge 4+ with which users can get a 50% of battery charge in 15 minutes. The Snapdragon 710 Mobile Platform is all about bringing AI to masses. The multi-core AI Engine inside the chip is expected to deliver a 2X improvement in performance as compared to Snapdragon 660. Talking about the connectivity, the Snapdragon 710 comes with X15 LTE modem, which is a Category 15 LTE modem that supports up to 800 Mbps download speeds. The new chipset also brings some of the most advanced 4G LTE technologies to the 700-tier, including 4×4 MIMO technology (on up to 2 aggregated carriers) for up to 70% faster download speeds in weak signal conditions, and License-Assisted Access (LAA) for faster speeds in crowded places, compared to phones that don’t support these features. It also offers new Wi-Fi features, Bluetooth 5.0, Qualcomm Broadcast Audio and Qualcomm TrueWireless Stereo Plus to support wire-free listening experience without wires between the left and right earbuds while delivering an enhanced user experience, including call voice in both ears, lower latency and longer battery life in the headset. Moving on, the chipset comes with new Qualcomm Spectra 250 ISP, which brings improvements to low-light photography, noise reduction, fast autofocus, image stabilisation, real-time bokeh effects and more. The Qualcomm Spectra 250 ISP is designed to deliver super resolutions with up to 32MP single ISP and 20MP dual ISP. Additionally, the AI Engine in the Snapdragon 710 supports speedy video style transfer, deep portrait modes and Face ID / Unlock with active depth sensing. On the display front, the Snapdragon 710 features 4K HDR playback for viewing HDR videos and apps – also a first outside the premium 800-tier. The addition of 4K HDR playback brings greater brightness, wider colour gamut and colour depth to the Snapdragon 710. Lastly, we have the availability. The Snapdragon 710 Mobile Platform is already up for grabs to mobile companies, and the smartphones with the newly announced chipset will be released by the end of this quarter itself. Seems like this is qualcomm’s reply to mediatek P60 chipset. Nope, as P60 phones start at 20k like the Oppo F7. Snapdragon 710 devices are gonna start at 30k because they will be almost 20 to 25% less powerful than the 835. They’ll be as good as flagship devices. Will Qualcomm launch a 500 series as an upgrade to 400 series SoC?? Yes but after a year or two as they are running out of number branding. Why, they launched 700 so may be 500 too. P60 phones are available at 9000!!!!!! Its May end already and mi max 3 not yet launched, people are speculating 638 on it, maybe the delay is due to 710 on it? Mi A1,max3 will come with sd636 only… 710 will be for xiaomi pro series….last year 660 model.